In typical Lower Mainland fashion snow decided to hold off until February to rear its frosty head, and here we are once again in the middle of a winter wonderland with the official arrival of spring just weeks away. The timing leads to an inevitable conclusion for most of British Columbia – snow melt. For commercial brick and mortar operations this seasonal phenomenon can be a real pain, presenting liability concerns to both property and person alike. 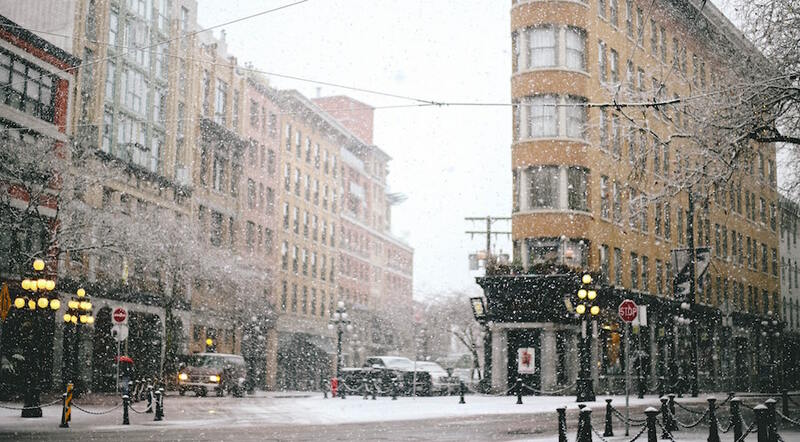 Today, Park Insurance is here with some advice on how to protect your shop from the threat of late winter and early spring snow melt common to Greater Vancouver and the entire province. Exposed brick and mortar operations will experience snow accumulation on the roof and gutters. Do not expect your roofing, gutter, and downspouts systems to take care of the snow melt on their own. Have your roof swept/raked to minimize snow build up and reduce the amount of melt that would otherwise come. The type of roof will determine frequency. Wood or metal commercial roofing typically fare well given the weight of the material and installation method and so you will only need to conduct snow removal after very heavy snowfall. However, if your shop is topped by a lightweight material such as asphalt your roof can become severely damaged during the seasonal melt, and therefore you should have the snow removed after every significant snowfall. Either way, have a professional inspect the roof as soon as the snow has been cleared to see if there is any damage that may result in water leaks, and if so have it repaired immediately. Of all roofing concerns, ice dams in gutters are often the most dreadful. When ice dams form after water from snow melt has frozen and clogged the gutters, your system becomes heavy and may collapse and cause major damage. Or, when the temperature warms, the ice dams will melt and your gutters will become flush with water, spilling over the edges and filling up the downspouts at a greater force that they can handle, also resulting in excessive water on the exterior of your commercial property, some of which can penetrate your store’s foundation. All gutters and downspouts should be inspected, cleared of debris, tightened, and repaired as necessary. An awning may provide prospective customers with a place to duck under (and view your window display) during precipitation but it can be a hazard when snow is allowed to accumulate and eventually melt. Melting clumps of snow and ice can slide down and hit passer-byers on the noggin and send them straight to the nearest law office for punitive recourse. Awnings should be cleared after every single snowfall, and even during snowfall when heavy. Also, never allow icicles to form on them. If you return to your business in the AM to find they have, chop them down and collect the ice in a bucket so that they don’t melt on the ground and reform as slippery slush or ice if temperatures drop. When there is the slightest air leak in the trim, baseboards, or ceiling of your establishment you face risk of water damage during the freeze-thaw cycle. Snow and frost will penetrate the smallest of fissures and when they melt water is allowed to infiltrate wooden wall cladding, panels, drywall, and finishing, resulting not only in an unsightly appearance but disrepair that increases the risk of greater damage to the store and products/materials within. Inspect for air leaks around the windows, trim, baseboard and ceiling of your store and apply caulking and additional professional repair when necessary. Another benefit of this initiative, is that when you catch and repair air leaks, you will prevent HVAC loss which can save your commercial business money on heating, cooling, and air quality improvement expenditures through all four seasons. Shovel and salt the exterior walkways and steps leading to and from your establishment. Keep in mind the during snow melt, slush becomes as much of a slip and fall hazard as ice, and shovel it away from your property but not on to a neighboring business’ exterior square footage. Instead, dispose of it into the road, preferably into a sewer opening. Also note that this should be done at the rear/side of your business (where applicable) as while customers may not enter the premises from there, staff and delivery people may. Liability extends to all areas surrounding your shop. One of the greatest threats during this time of the year is slip and fall liability. You must be even more diligent in protecting customers and your business during the snow melt. Revisit your slip and fall prevention plan, review procedures, provide adequate lighting for the floor through the store, position warning (i.e. slippery when wet) signage in plain view, and make customers aware of the risk. View our complete guide to preventing slip and fall accidents in your place of business for more insight. In addition, it’s important to understand that the risk of false slip and fall claims can inflate during the soggy days of snow melt. Fraudsters may come out of the woodwork, knowing that many stores are not prepared to deal with slush being tracked into the establishment. Park Insurance is one step ahead of those who wish to step into your business and do harm to your premiums. View our 5-item guide to protecting your business from fake slip and fall claims. Lastly, be sure to have an independent insurance broker review your current commercial ensure policy to confirm that you have adequate coverage for all damage and liability that can come at this unique but impactful time of the year. Contact Park Insurance right away.